Is the juicer you’re using safe for your family? Are you drinking oxidized juices? You probably know by now, that fresh juice is good for you. You want the best for your family, that’s why you bought a juicer in the first place. But is the juicer you’re using safe for your family? Are you using a centrifugal juicer to extract your juice? While I understand that we want to be economical when buying a juicer, but are we really “saving” when we go for a cheaper, high-speed spinning juicer? 1. 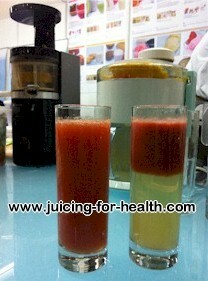 Juice extracted using a centrifugal juicer is almost VOID of enzymes, nutrients and vitamins. A centrifugal juicer works by cutting up the fruits with a sharp blade and spins the chopped up produce at a very high speed (of about 3,000 to 16,000 RPM) to separate the juice from the pulp. This method of juice extraction destroys the enzymes and nutrients. The water is spun out very much like how a washing machine spins dry your wet clothes. What is extracted? Mainly WATER content. What happened to the enzymes and nutrients? They are still embedded in the pulp which was choppped up and little else was done to extract them into your juice. The high-speed blade chopping does not penetrate the produce deeply enough to extract precious nutrients of the juices. Unlike what most other websites mention about “heat” being the culprit to destroy the enzymes, that is NOT true. The high-speed spinning causes exchange of +ve and -ve ions that result in oxidation which destroys enzymes. I did a little experiment by juicing an apple using both a centrifugal juicer and an Alpha Juicer (or equivalent model: Omega 8003/8005). I noted that the juice extracted from a centrifugal juicer is mainly just clear brown water—void of nutrients. (See picture below). 2. Juice is oxidized. Oxidized juice is in effect, spoiled juice. As you now know, the centrifugal juicer works by spinning the produce at a very high speed of 3,000 to 16,000 RPM. This high-speed spinning traps a lot of air into the juice, causing some +ve and -ve ion exchanges that quickly oxidize the juice. Oxidation is the “dark side” of oxygen. It is what happens when a cut apple exposed to the air turns brown. In other words, the iron content in apple rusts. This process quickens when an apple is cut and spin at a very high speed. Prolonged exposure to oxidized juice or rusts (imagine a rusty nail), becomes toxic and thus creates havoc in our body system. Oxidation or oxidative stress in our body has been known to be one of the major causes of many degenerative diseases in our times. On the top right of this page is a search box. Do a search on “oxidative stress” and see what it does to our health. There is argument that people do see some good results by drinking from centrifugal juicers. I agree that could be true INITIALLY. But oxidation (rusts) STAY in the body. I would not take the chance as we’re talking about drinking many liters of juices daily. You can do this test at home, if you have a centrifugal juicer. Try juicing an apple and pour it into a clear glass. Leave it for just one minute, for the juice to settle. You will notice that the foam is very brown and the water is clear brown (void of enzymes and nutrients, it is mainly just the water content). DRINK that juice. Does it taste metallic? What does it tell you? Related reading: Cheap slow/masticating juicers: Should you get one? 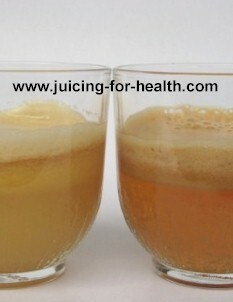 Here’s a picture I have taken to show you the difference in the juices produced by both a single-gear juicer (on the left) and a centrifugal juicer (on the right). Here’s another picture that shows how the juices extracted using a centrifugal juicer separates to reveal the absence of enzymes and nutrients. Read how a gear juicer can help minimize agricultural chemicals and pesticides contamination in your juice.